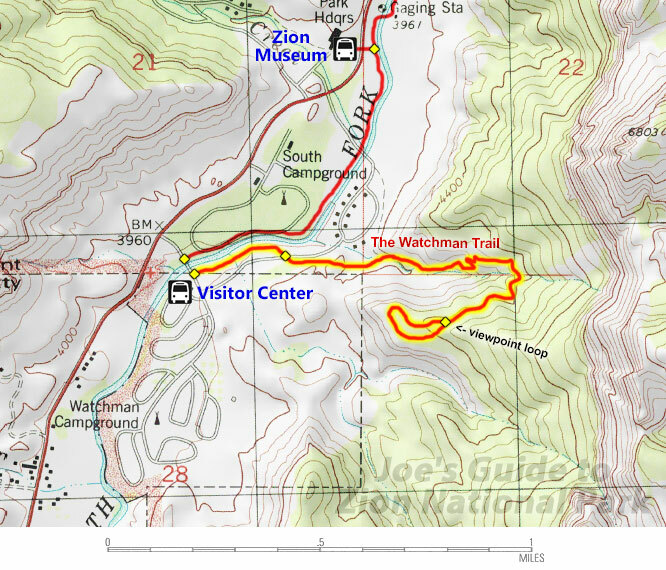 Starting in between the Visitor Center and the South Campground, the Watchman Trail is a short trail (roughly 3 miles round-trip) that heads up to a viewpoint on top of the first layer of cliffs roughly 300 feet above the canyon floor. While the trail doesn't actually take you to the top of the Watchman mounting, you can still get a good view of the famous and photogenic peak to the south as well as a good bird's eye view of the whole Visitor Center complex below. The trail is mostly family-friendly, but keep a close eye on children as there are a few cliff edges to pay attention to. This trail is completely exposed to the sun, so during the hot summer months, this hike is best done on a cloudy day or in the morning when this side of the main canyon is still in the shade. Elevation Change: 300-ft elevation gain up to the viewpoint. 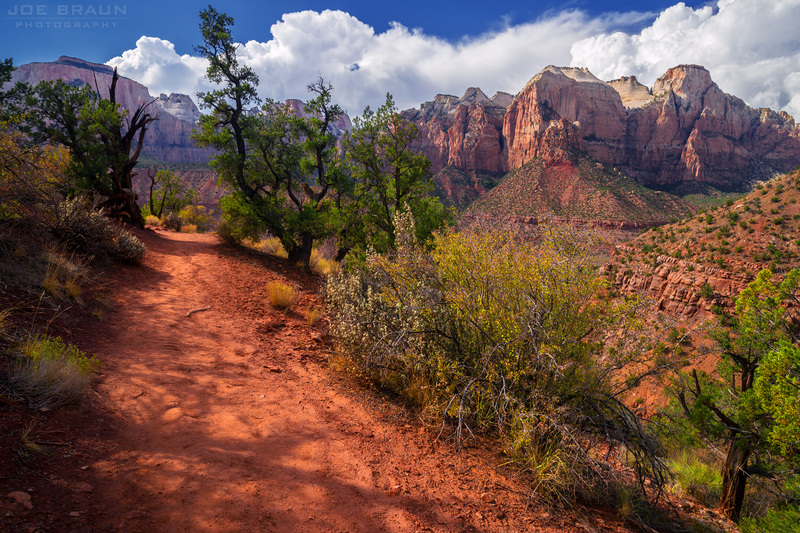 The trail starts around the Zion Visitor Center. Simply walk the road towards the main Route 9 road and you will see the trailhead sign on the north side of the road, on the east bank of the Virgin River. The trail starts out unglamorously, first hugging the banks of the river, then heading behind some employee housing and construction materials. Once we head into the hills, the area gets a bit more charming. For the next mile, the trail gets moderately strenuous, heading uphill and looping around a small valley until we are on top of the first layer of cliffs above the main canyon. Once the trail heads back west, we reach the quaint viewpoint that gives us a good view of the main canyon -- the Visitor Center complex just below, Springdale in the distance, and the majestic Watchman Peak to the south. If it's not burning hot out, the view point is a great place to relax and have lunch. A short loop trail has been added that affords more views to the south. Once you have had your fill on the loop, it's time to head back down to the main canyon. 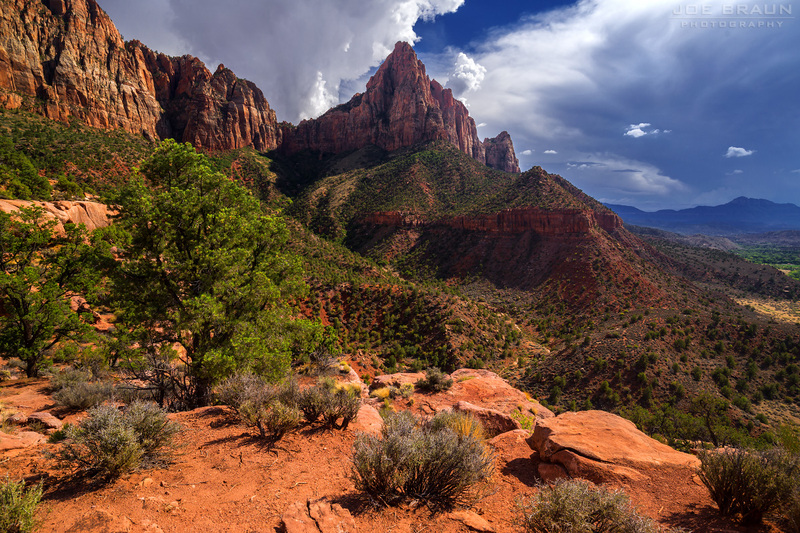 This isn't the most exciting hike in Zion and it's not the most stunning viewpoint either, but it is a pleasant little hike, especially if you have a few hours to kill in the early morning or on a cloudy day. One plus: this trail gets much less action than the more popular crowded hikes in the main canyon.